1. How lon g have you been at Standby Screw? 3 years in March. 2. What is your favorite thing about working here? It is a fast-paced place to work. You will not get bored with nothing to do. 3. If you could travel anywhere in the world, where would you go and why? Tahiti – Warm water, beautiful beaches – your basic tropical paradise. What else do you need to say? Also, the Cenotes of the Riviera Maya. Some of the most beautiful underwater caves to explore in the world. 4. What do you like to do for fun? It used to be Cave SCUBA Diving & Hiking. Now it is taking the kids down to the corner for ice cream. 5. If you had one important piece of “life” advice to give someone, what would it be? You’re never too old to make a life change. If you discover your dreams later in life – go for it. 1. How long have you been at Standby Screw? I have been at Standby for a little over 27 years. 3. If you could travel anywhere in the world, where would you go and why? I travel everywhere now. I like the idea of being at home better. But if you press me, I would not mind seeing Vienna. 4. What do you like to do for fun? I enjoy spending time with my wife, listening to and making music, reading, and spending time at the lake. 5. If you had one important piece of “life” advice to give someone, what would it be? Learn to write well. The digital age has once again made written communication an important skill. And it covers for a multitude of other faults. 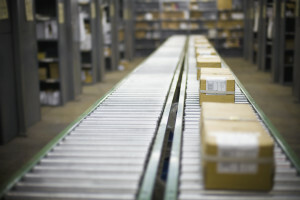 When you think of a conveyor system, oftentimes a conveyor belt will come to mind, showing items moving in one direction. That would be exactly right. Conveyor systems are common pieces of mechanical handling equipment that move materials from one location to another and are especially helpful for moving heavier items. These systems allow for quicker and more efficient movement in a product line and are especially handy in the material-handling and packaging industries. All conveyor systems are not the same, however. Chain conveyers also exist and consist of enclosed tracks, power & free, hand-pushed trolleys, etc. The next time you’re near one of these industries, look out for the different conveyor systems they use!